As soon as I got back from Hard Rock Bangkok, I had to get ready for the "Wan Fah Dinner Cruise" at 7pm. The day before, we booked a reservation for "Wan Fah Dinner Cruise" through the travel agency in front Boiyoke Sky Hotel. By 6pm we go into van with other tourists and headed to Rivercity Pier 1, one of piers at Chao Phraya River. Riverbird was so excited because he will be having dinner on an antique boat while crusing along "The River of Kings"
After 30mins, finally we arrived at RiverCity Pier 1. Welcomed by lovely crew in Thailand traditional costume and she helped us to wear Orchid flower pin on our outfit. Their photographer helped us to take group photo with the lovely lady in Thailand costume and the photo come together with frame and cost us for 200baht. Once seated, we order a juice drinks which cost us 150baht per glass. Not included in our menu set. While waiting for our food, we were entertained by traditional music playing. For our dining, there are 2 kinds of set menu to choose from, authentic Thai set menu and Seafood set menu. Both of us choose Thai set menu for our dinner. 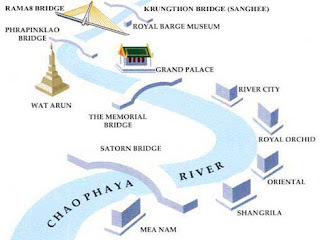 We sailed from Rivercity Pier 1 to Rama 8th Bridge and past some famous historical landmarks along Chao Phraya River. After dinner, entertained by Thai dancers perform classical dances, a dramatization of Ramakien story based on the Indian epic Ramayana and also some Thai traditional dances. I thought the cruise was going to be a little longer and I didn't realize that 2 hours had already gone by. We reached the pier and time showing 8.50pm. Samphanthawong District, Bangkok 10100 Thailand. "An unusual piece of chocolate"
am still not too late......am i?? How milk can prevent stress??? ?